I’m about halfway through a 12-month secondment from the Cabinet Office to the Movement to Work programme. Movement to Work was started by a group of chief executives from some of the UK’s largest employers, and is designed to provide high-quality work experience and training to unemployed young people. 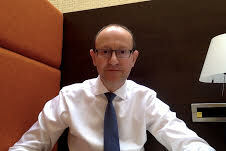 Marc Bolland, the chief executive of Marks and Spencer, has been one of the driving forces behind Movement to Work since he launched it alongside the Prime Minister in October 2013. The programme has had some great coverage in the national press recently, and the really sharp-eyed among you may have spotted that BAE Systems are using the Movement to Work logo in their video advertising at major railway stations! Why is work experience important? Because all the evidence shows that people who are able to go on a high-standard work experience placement are far more likely to go on to find a job. And finding jobs is what Movement to Work is all about. Our aim for 2015 is to have a firm commitment from employers to run 100,000 work experience placements and help at least 50,000 young people find jobs (or, in some cases, go on to further education or training). This area has had some bad press in recent years, with one or two companies accused of running so-called “work experience programmes” to cover resource gaps. Movement to Work doesn’t want to be connected with any employer that exploits young people in this way. Our opportunities are all voluntary, and we want to support young people who are motivated by the opportunity being offered. So, if the programme’s led by employers, how did I get involved? Movement to Work isn’t a government initiative, but it does have strong government support. In fact, the entire Civil Service has signed up to support it and has run over a third of the total placements to date across a number of departments. Five of the participating employers (M&S, Accenture, WPP, HSBC and the Civil Service) have agreed to second people to form a small core team to manage the programme. I’d been invited to attend a few programme meetings to talk about supplier involvement, and last August I was pleased to be asked to join the central team. My role in the small programme team – there are just six of us – is to be the link between Movement to Work and the many other initiatives aiming to provide support to unemployed young people in the UK. So I work with colleagues in DWP, BIS and the Cabinet Office to ensure that everything fits together as neatly as it can. How are we doing so far? From a standing start in late-2013, we now have 24 large UK employers and another 175 smaller companies on board. The latest returns from employers show that we have run over 12,000 work experience placements, with around 50% going on to find work. 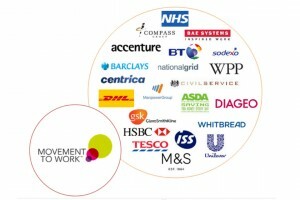 All of the employers joining Movement to Work are committed to persuading other companies to join. If we deliver on our plans, we should have over a thousand UK employers offering work experience and training placements to young people by the end of the year. Before joining the programme I had spent over 20 years in the commercial world of government. I enjoyed trying to get better value for government expenditure, but joining Movement to Work has given me a very different insight into the private sector and the efforts many of our largest employers are making to address social issues in this country. All of us in team are passionate about making the programme succeed so we can go on to help even more young people who just need a chance to show what they can do. When you meet those who have transformed their lives after completing one of our programmes, you can see what can be achieved when public and private sector work together.